^ De Andrea, Marco; Ravera, Raffaella; Gioia, Daniela; Gariglio, Marisa; Landolfo, Santo (2002). 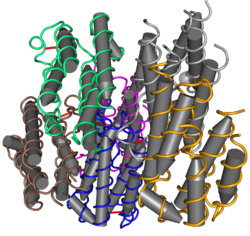 “The interferon system: an overview”. European journal of paediatric neurology: EJPN: official journal of the European Paediatric Neurology Society 6 Suppl A: A41–46; discussion A55–58. ISSN 1090-3798. PMID 12365360. https://www.ncbi.nlm.nih.gov/pubmed/12365360. ^ Parkin, J.; Cohen, B. (2001-06-02). “An overview of the immune system”. Lancet (London, England) 357 (9270): 1777–1789. doi:10.1016/S0140-6736(00)04904-7. ISSN 0140-6736. PMID 11403834. https://www.ncbi.nlm.nih.gov/pubmed/11403834. ^ Goldstein, D.; Laszlo, J. (1988-9). “The role of interferon in cancer therapy: a current perspective”. CA: a cancer journal for clinicians 38 (5): 258–277. ISSN 0007-9235. PMID 2458171. https://www.ncbi.nlm.nih.gov/pubmed/2458171. ^ Cooksley, W. Graham E. (2004-03-18). “The role of interferon therapy in hepatitis B”. MedGenMed: Medscape General Medicine 6 (1): 16. ISSN 1531-0132. PMC: PMC1140699. PMID 15208528. https://www.ncbi.nlm.nih.gov/pubmed/15208528. ^ Shepherd, J.; Waugh, N.; Hewitson, P. (2000). “Combination therapy (interferon alfa and ribavirin) in the treatment of chronic hepatitis C: a rapid and systematic review”. Health Technology Assessment (Winchester, England) 4 (33): 1–67. ISSN 1366-5278. PMID 11134916. https://www.ncbi.nlm.nih.gov/pubmed/11134916. ^ Sharieff, Khavir A.; Duncan, David; Younossi, Zobair (2002-2). “Advances in treatment of chronic hepatitis C: 'pegylated' interferons”. Cleveland Clinic Journal of Medicine 69 (2): 155–159. ISSN 0891-1150. PMID 11990646. https://www.ncbi.nlm.nih.gov/pubmed/11990646. ^ “NIH Consensus Statement on Management of Hepatitis C: 2002”. NIH consensus and state-of-the-science statements 19 (3): 1–46. (2002 Jun 10-12). ISSN 1553-0957. PMID 14768714. https://www.ncbi.nlm.nih.gov/pubmed/14768714. ^ The interferons : characterization and application. Meager, Anthony., John Wiley & Sons.. Weinheim: Wiley-VCH. (2006). ISBN 3527311807. OCLC 85821186. https://www.worldcat.org/oclc/85821186. ^ de Weerd, Nicole A.; Samarajiwa, Shamith A.; Hertzog, Paul J. (2007-07-13). “Type I interferon receptors: biochemistry and biological functions”. The Journal of Biological Chemistry 282 (28): 20053–20057. doi:10.1074/jbc.R700006200. ISSN 0021-9258. PMID 17502368. https://www.ncbi.nlm.nih.gov/pubmed/17502368. ^ Espinosa, Vanessa; Dutta, Orchi; McElrath, Constance; Du, Peicheng; Chang, Yun-Juan; Cicciarelli, Bryan; Pitler, Amy; Whitehead, Ian et al. (2017-10-06). “Type III interferon is a critical regulator of innate antifungal immunity”. Science Immunology 2 (16). doi:10.1126/sciimmunol.aan5357. ISSN 2470-9468. PMC: PMC5880030. PMID 28986419. https://www.ncbi.nlm.nih.gov/pubmed/28986419. ^ Bartlett, Nathan W.; Buttigieg, Karen; Kotenko, Sergei V.; Smith, Geoffrey L. (2005-6). “Murine interferon lambdas (type III interferons) exhibit potent antiviral activity in vivo in a poxvirus infection model”. The Journal of General Virology 86 (Pt 6): 1589–1596. doi:10.1099/vir.0.80904-0. ISSN 0022-1317. PMID 15914836. https://www.ncbi.nlm.nih.gov/pubmed/15914836. ^ Fensterl, Volker; Sen, Ganes C. (2009-1). “Interferons and viral infections”. BioFactors (Oxford, England) 35 (1): 14–20. doi:10.1002/biof.6. ISSN 0951-6433. PMID 19319841. https://www.ncbi.nlm.nih.gov/pubmed/19319841. ^ Platanias, Leonidas C. (2005-5). “Mechanisms of type-I- and type-II-interferon-mediated signalling”. Nature Reviews. Immunology 5 (5): 375–386. doi:10.1038/nri1604. ISSN 1474-1733. PMID 15864272. https://www.ncbi.nlm.nih.gov/pubmed/15864272. ^ Schoenborn, Jamie R.; Wilson, Christopher B. (2007). “Regulation of interferon-gamma during innate and adaptive immune responses”. Advances in Immunology 96: 41–101. doi:10.1016/S0065-2776(07)96002-2. ISSN 0065-2776. PMID 17981204. https://www.ncbi.nlm.nih.gov/pubmed/17981204.